Isidre Esteve, driving a car only with his hands, is just days away from finishing his second consecutive Dakar Rally on four wheels. 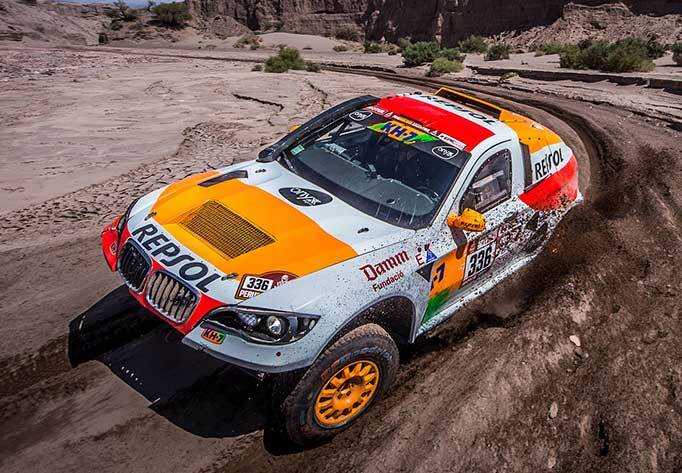 The Repsol Rally Team driver ended Thursday in 26th place with a good score in the largest special of this year's race. With just two stages to go, he is just outside the top 20 in the overall classification in 23rd position. Esteve and his co-driver, Txema Villalobos, had another complicated day travelling over sand, hard track, and rocky sections. "After the first liaison and just before the start of the special, we realized the engine water pump was broken. We decided to backtrack 60 kilometres to get the part changed and, as a result, we started the special two hours after our assigned time", said the driver after crossing the finish line. This initial setback had a knock-on effect on the driver's progress in his BV6 prototype from Sodicars Racing with adapted controls on the steering wheel by Guidosimplex. "Because of the delay we started out behind lots of trucks, so there were some deep, dangerous tyre tracks. In the second sector, we upped our pace and climbed up a few places. Overall, we're happy to have finished another day and are looking forward to finishing the Dakar", commented Isidre Esteve. Esteve spent a total of 8 hours and 35 minutes behind the wheel, which provisionally put him in 4th place in the T.1.2 category, reserved for modified diesel 4x4s. In the overall cars ranking, he is currently in 23rd place with an accumulated time of 63:20:23 hours. "There's just two days to go and we're on track to meet our objectives. However, in this race you can't let your guard down for a second or take anything for granted. We will do our best and enjoy every last second of the race", said Isidre Esteve.